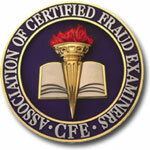 The Certified Fraud Examiner (CFE) and Certified in Financial Forensics (CFF) credentials denote proven expertise in fraud prevention, detection and deterrence. CFEs and CFFs are trained to identify the warning signs and red flags that indicate evidence of fraud and fraud risk. CFEs and CFFs around the world help protect the global economy by uncovering fraud and implementing processes to prevent fraud from occurring in the first place. The standards for CFE certification are set by the ACFE’s Board of Regents, who are elected by CFE members and drawn from the most experienced members of the profession. CFE candidates must hold a Bachelor’s degree from an accredited institution and posses two or more years of professional experience in a field related to fraud deterrence and detection and maintain at least 20 hours of CPE each year. The standards for CFF certification are set by the AICPA, American Institute of Certified Public Accountants. CFF candidates must hold a valid CPA license, pass the CFF examination and posses a minimum of 1,000 hours of business experience in forensic accounting and 75 hours of forensic accounting related CPE. As leaders who inspire public confidence in the integrity and objectivity of the profession, CFEs and CFFS adhere to the a Code of Professional ethics.